Ah, the Chipmunks! I do remember watching the show on TV and it used to be one of my favorites. It brings back so many memories of when I was a kid, I was obsessed with the lovable animated and singing-star chipmunks, still am a bit you could say. The characters are fondly remembered and I love the songs. I just love the chipmunks' voices. Besides the Smurfs, I also got a chance to get up-close with the live-sized costumed mischievous rodents, Alvin, Simon & Theodore! Say hi to Theodore, Alvin and Simon. 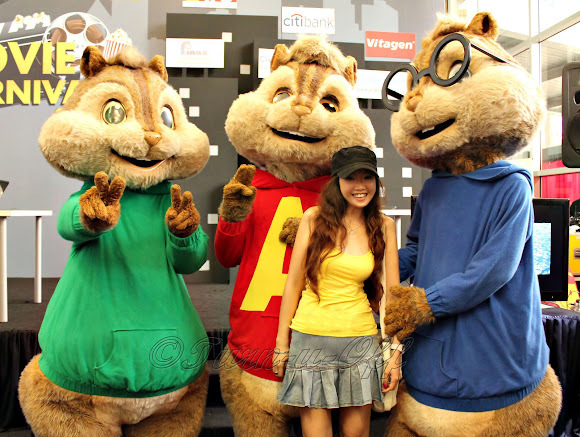 The upcoming "Alvin and the Chipmunks: Chip-Wrecked" is expected to release this December 15, 2011 at Malaysian cinemas nationwide. Alvin, Simon and Theodore are back for a third big screen adventure! 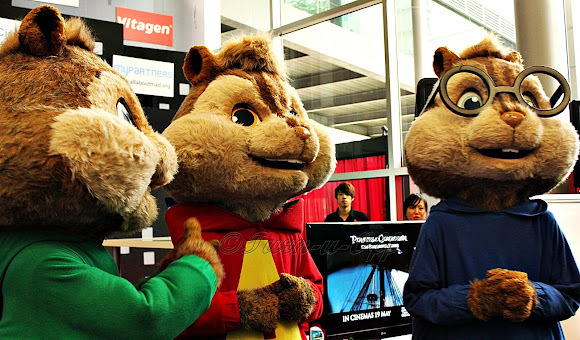 The Chipmunks are cute eh? And they are so big compared to you! Haha!! Oh yes, they are so funny when they sing! LOL! awww so cute lah chipmunks.. me loves!!! All Dads Eat Free on Father's Day!